The company has just introduced its own range of trade rated hex shank bits under the brand name Axminster Trade Bitz. The Axminster Trade Bitz range fulfils the need for a well-made accessory that will take everything the trade demands. These bits are made from S2 steel with accurately forged tips for fit and strength, and finished in either wear resistant TiN or sand blasted. Most cordless drills and screwdrivers have a keyless chuck and some only have a hex fitting. The range of hex shank bits and holders is constantly increasing. The shanks of Axminster Trade Bitz holders, long screwdriver bits and torsion screwdriver bits are universal. The shanks have a double groove and special machining makes them compatible with all makes of 6mm hex quick change and magnetic bit holders. Various sets are available. The 11-piece set comprises an 85mm quick release bit holder with a universal shank and 10 sand blasted finished, colour coded bits. The 28 piece set is a high quality, trade rated bit set. The kit comprises a universal shank magnetic bit holder and an assortment of 27 colour coded bits. There is also a very useful 28 piece mixed set of TiN coated screwdriver bits. The set contains two universal shank magnetic double groove bit holders - locking and non-locking - and 26 colour coded bits. 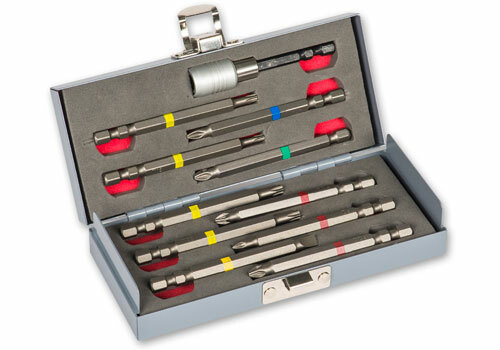 All three sets come in a robust steel storage case lined with industrial foam to prevent the bits rolling around. The bits are also available individually. Prices include vat and are valid until 31 December 2015.